“I will support properly run and appropriately located supervised injection facilities,” Larry Krasner, the Democratic nominee for Philadelphia District Attorney, announced Wednesday. As the opioid epidemic continues to impact the entire country, Philadelphia District Attorney candidate Larry Krasner is supporting an idea that has never been tried in the United States; safe injection clinics where drug users can self-inject in a clean environment under medical supervision. NBC10's Drew Smith has the details on the controversial plan. As the opioid crisis continues to devastate the nation, a Philadelphia District Attorney candidate is showing his support for an idea that has never been tried in the United States; supervised injection clinics where drug users can self-inject in a safe and sterile environment. Are Safe Injection Clinics the Answer to Opioid Epidemic? The sites are legally-sanctioned facilities with the purpose of reducing public drug use and providing a hygienic and stress-free environment for people to inject drugs. Drug users have access to clean needles, sanitary facilities and medical professionals who can connect them with rehabilitation and other health resources. There are currently approximately 100 supervised injection facilities operating in 66 cities in nine countries, including Canada. No such facility exists in the United States however. Other U.S. cities, including Seattle, have considered safe injection facilities. The proposals have sparked controversy. Expansion of NJ's Medical Marijuana Program? Beth Grossman, Krasner’s Republican opponent in the Philadelphia District Attorney race, also said it could be a good pilot program with community input. She’s also open to mobile safe injection sites. One issue is the numerous amount of needles on the ground in Philly’s public parks. “The safe injection zone I’m up for it for sure,” said Vincent Colon, a resident of Kensington, one of the Philadelphia neighborhoods hit hard by the opioid epidemic. Colon told NBC10 drug users will usually get their fix no matter what and providing a secure place for them will make it better for neighbors. Nicole Stevens, a Kensington resident who struggles with drug addiction, told NBC10 her neighborhood is one of the most dangerous places for her to be in. A petition calling for Philadelphia to create safe injection clinics was made earlier this year. So far it’s gained 1,742 supporters. More than 900 people died from heroin or opioid overdoses in Philadelphia last year compared to 277 homicide deaths, according to police records. 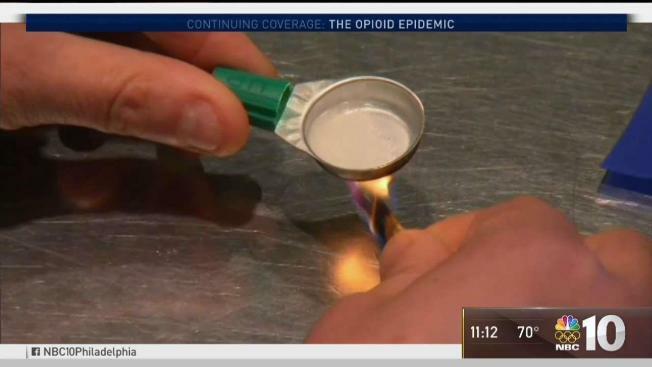 Nationally, drug overdose deaths involving heroin increased from 8 percent in 2010 to 25 percent in 2015, according to a study by the Center for Disease Control and Prevention. Similarly, overdose deaths involving synthetic opioids increased from 8 percent in 2010 to 18 percent in 2015. In Philadelphia, more than 55,000 residents are thought to be misusing or abusing opioids, city officials said. Often users will quickly move from powerful painkillers to heroin when they can no longer afford the legal drugs. NBC10 explored this transition and how the crisis is claiming an increasing number of lives in a special, six-month long investigation, Generation Addicted. In response to the ongoing crisis, Mayor Jim Kenney formed The Mayor’s Task Force to Combat the Opioid Epidemic. Members of the Task Force said in a report that they’re exploring the idea of safe injection clinics and talking with experts. They also plan to send a delegation to a supervised injection facility in the fall.